Aaron Dalton joins us from the UK, where he runs FOUR Sharing Kitchen, a heralded pop-up series operating in Brighton and Hove. 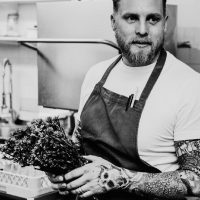 Earlier in his career, Aaron worked in London at a number of Michelin starred restaurants including Chez Bruce and Fera, and staged under chefs Marcus Wareing, Oliver Dabbous and Heston Blumenthal. As Head Chefs of the Smoking Goat, Aaron and Scott led the team to achieve numerous accolades and feature on a number of “Best of” lists. Aaron cooks modern, seasonal, British food using techniques from around the world with an emphasis on quality, fresh ingredients that are locally and UK sourced wherever possible.